400th Post ~ Thanks to everyone! I couldn’t have done it without you. 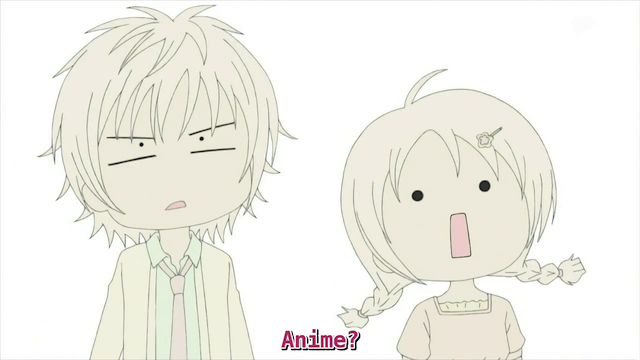 The reaction I get regularly when I tell people I blog about anime. Yes, this is the 400th post I have made here on the Abandoned Factory. I started this blog on a whim, but I have learned so much over the past couple of years. And there is no question in my mind about it: I couldn’t have done it without the support and inspiration that I get from everyone out there in the Internet. So thank you, thank you, thank you to all of the folks who drop by to see what I have to say, and to those who leave me comments about what they have to say, and even for those folks who never stop by, but who have led by example, typing up blog posts year after year. I have enjoyed my time in the Aniblogiverse, and never intend to go home. Yeah, actually I’m typing this from home, but I’m also right here with y’all, enjoying anime. to watch in the coming year! It’s a friendly place to stop by and chat. That makes a difference. You’re welcome, and thank you. And you’re welcome, and thank you again! Congratulations and thank you! It’s been wonderful to read what you’ve written, and I look forward to reading more in the future. Cheers! WOW! What an achievement. But I’ll just treat this milestone as your warm-up, since I hope you’ll be around forEVER. I’m sure yours are hard to count, because on top of all of your solo posts, you team up a lot. I’m lucky in that sense, everything that gets done gets done by me or it don’t get done, so I know exactly how many posts I have made. Eh, 400 posts already?! Congrats, Joojoo! Always a pleasure hearing your views on stuff, and not just on the same stuff we happen to be watching (though I’m pleased that we do seem to have a fair bit in common on that front). THX, Hana. And I must say, I’m constantly jealous of all the tasty-looking desserts you eat. Gratz on 400, you’re doing a fantastic job with this blog and I’m happy to see you reaching another milestone. Keep up the great work and I’m looking forward to your next 400! Thanks. It is certainly is great getting to participate in a conversation about anime with folks such as yourself. I consider myself lucky. And I the same. It really is a wonderful community we have here, even with all the different tastes and variations everyone likes. And judging from all the comments you’re getting, everyone agrees, too. Yes! Absolutely. I used to participate in anime bulletin boards, but that wasn’t always a positive experience. Later I started reading and commenting on anime blogs, and found the community to be intelligent and friendly. I have been having a great time participating ever since. Does this make you possibly the oldest active anime blogger? I remember there used to be an old guy who did video-logs of anime and he was probably around 70 or 80. Either way, keep it up since I do use this as a way to keep myself caught up on the conversation when schoolwork causes me to fall behind on an episode or 2 or 3. Oldest active anime blogger: It sure feels like it some days. I have no real way of knowing, however. I haven’t quite made it to 80, and I know there were some folks on the Anime Suki bulletin board that were older than me. Well, after poking around, I found an answer, I definitely am NOT the oldest active anime blogger. I found a blog called, “Too Old For Anime“, where the author is older than I am. Thank you. I definitely take a lot of inspiration from the ceaseless effort you put in over at The ‘Norn. I guess I have the advantage of not needing pain killers just to type. Yes that does give you an edge! You know, your blog is one of the few ‘serious’ episodic-anime blogs that I actually enjoy reading. Most other episodic-anime blogs I enjoy reading are those that make fun of anime, and most ‘serious’ episodic-anime blogs feel too boring. Somehow, you manage to not be boring without even deviating from talking about anime (something… other, heh, blogs frequently do).